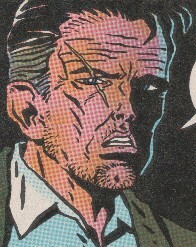 Powers/Abilities: Mike Hellman is attuned to psychic energy and emotions. (Marvel Frontier Comics Unlimited#1/5 (fb)) - Mike Hellman had some negative history with the press. (Marvel Frontier Comics Unlimited#1/5 (fb)) - Mike was summoned by Tom, a policeman of some sort, to aid in the mysterious death of Emily Hearst, who had been found dead in her room atop a tower -- locked from the inside -- with pencil-diameter whole through her forehead caused by a concentrated energy beam. Investigating the deceased's survivors, Hellman was surprised to find no sense of loss or grief in either of Emily's children: Theo was a blank, while Lisa held a terrible weight of guilt. Hoping to catch any psychic residue, Hellman spent the night in the tower-room, and he received a power psychic vision of Emily's death from Lisa's nightmares. Rushing to Lisa's room, he found her levitating far above her bed. Realizing that Lisa could have levitated up into the tower-room from her locked bedroom, Hellman confronted her the next morning. Lisa revealed how her mother had tried to exorcise the demons from her children after learning of their powers, even resorting to physical abuse. Fearing for his sister's life, Theodore had unleashed the power he didn't even know he had, firing an energy blast from his forehead through his mother's skull. Lisa had brought Theodore out of the trance into which he had fallen, but as she was telling the story to Hellman, Theodore unwittingly used his powers again in a virtual reality game. Theodore slew his friend, Bob, and then Theodore's mind became lost in the virtual reality game. (Marvel Frontier Comics Unlimited#1/5 (fb)) - The murder of Emily Hearst was left officially unsolved, and Hellman's involvement was kept secret. (Marvel Frontier Comics Unlimited#1/5) - Hellman detailed the Hearst's story in private. Comments: Created by David Hine. Marvel Frontier Comics was the edgier imprint of Marvel UK. This story was listed as "The Locked Room: An 'Evil Eye' prologue." However, this was the last comic published in the Frontier Comics line, and so any further story remains untold. There is nothing else to define the date or location of this story. Presumably it would have taken place either in the USA or the UK, but there's nothing to confirm one way or the other. 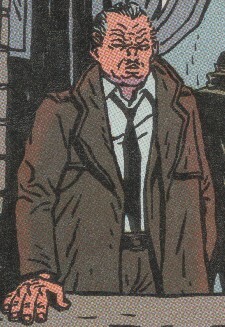 The Marvel Atlas confirms that Mike Hellman is a citizen of the United Kingdom. 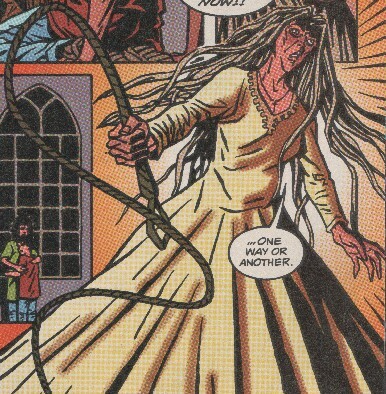 The sister of Charlotte and the mother of Lisa and Theodore, she was devoutly religious and saw her psi-powered children as the Devil's offspring. After her husband left she tried to exorcise the evil from her children, forcing them to memorize and recite whole chapters from the Bible and slapping their hands with rulers if they made mistakes. She forbade the use of their powers and had whipped Lisa in the past. When she discovered Lisa using her powers while playing with Theodore, she brought them both to the tower. When she prepared to whip Theodore, Lisa lashed out with her telekinetic powers, knocking her mother across the room. Lisa had exhausted her powers, and when her mother began to choke the life from her, Theodore unconsciously unleashed his own power, firing an energy beam through Emily's forehead and into her brain, killing her. The children of Emily and the niece and nephew of Charlotte, they both developed psychic powers. Lisa could levitate herself and others, and project telekinetic blasts. Theo could fire a laser-like blast from his forehead. He was unaware of this power and blacked out every time he used it; only Lisa could coax him back to reality. After their father left, Emily tried to exorcise the evil from her children, forcing them to memorize and recite whole chapters from the Bible and slapping their hands with rulers if they made mistakes. She forbade the use of their powers and had whipped Lisa in the past. When Emily discovered Lisa using her powers while playing with Theodore, she brought them both to the tower. When she prepared to whip Theodore, Lisa lashed out with her telekinetic powers, knocking her mother across the room. Lisa had exhausted her powers, and when her mother began to choke the life from her, Theodore unconsciously unleashed his own power, firing an energy beam through Emily's forehead and into her brain, killing her. Lisa then levitated herself and Theo out the window and back into the rest of the lower parts of the house, leaving their mother's dead body inside the tower-room, which she had locked from the inside. Lisa coaxed Theo back to reality, and he remained unaware that he had killed his own mother. While Mike Hellman questioned Lisa, Theo accompanied his friend Bob to the arcade where they played a virtual reality game. Theo played the part of the last survivor of an Earth expedition to an alien world, while Bob played a mutated killer android. Theo was to find hidden weapons to use against Bob, but Bob's monstrous form and acting terrified Theo, who unleashed his energy blast, killing Bob in the real world. Theo was left in a catatonic state as his mind remained on the virtual reality world. He accompanied his friend Theo to the arcade where they played a virtual reality game. Theo played the part of the last survivor of an Earth expedition to an alien world, while Bob played a mutated killer android. Theo was to find hidden weapons to use against Bob, but Bob's monstrous form and acting terrified Theo, who unleashed his energy blast, killing Bob in the real world. Theo was left in a catatonic state as his mind remained on the virtual reality world. Bob's parents sued Virtual Reality Inc. for causing the death their son through gross negligence. Emily's sister, she apparently took custody of Lisa & Theodore after their mother's death. A policeman (or whatever he would be in whatever country he lived), he was stumped in the mysterious death of Emily Hearst, so he called in the psychic Mike Hellman to investigate. He and Hellman were on a first name basis.